The Luftwaffe Bomber force has never been covered very well. They took a great deal of punishment throughout the war. This book, and the first volume, serve to remedy this lack of information. Taking up where the first volume left off. The newest book from Classic Publications is the typical reference we’ve come to expect from this publisher. This 200+ page hardbound book is printed on high quality paper. The page count starts where the first volume left off. Each unit is treated the same way. Each Gruppe in the Geshwader is covered from formation through employment until the unit is either redesignated, dissolved or was destroyed. The text is not easy to read, however, that is not what this book is about. The best part of this book the research. Each Geshwader includes the Archival, unpublished, and published sources that the authors used to determine the unit histories. Additional reading is also included for those who want to do further research on each unit. Most of the units have photos of the various aircraft assigned. These photos are both color and black and white. The photos are well reproduced and many are previously unpublished. Every type of bomber is covered from the early and prewar bombers such as the Do-23 to the late war types such as the Me-328 are covered. Fighter bombers are not forgotten either with photos of FW-190s, Bf-109s and Bf-110s covered. Mistel types are covered in the appropriate sections. The main bomber types are covered in great detail with many unique paint schemes and markings. Aircraft such as the He-111, Ju-88, Do-17, as well as, the lesser known types such as the He-177, Ar-234 and Hs-123s are shown to great effect. There is something here for everyone. Even captured allied types such as the B-17, B-24 and Sterling are covered. I particularly liked the color photos of the He-177 both in flight and on fire. Many of the units emblems are shown in full color in the margins of the book. There is an index of the bomber unit identity codes so that a historian or modeler can identify a unit from a photo. 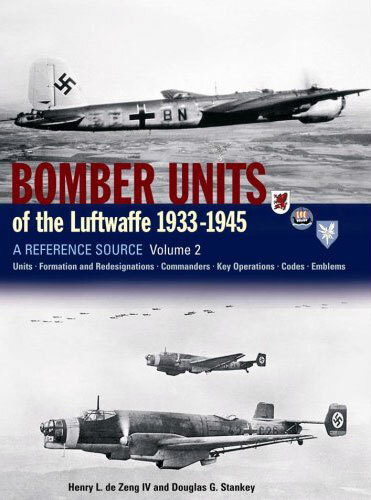 There is also an index containing a bibliography for those looking to expand their knowledge on the bomber force. A personnel index is also included, as well as, a location index. This is a research document, plain and simple. The quality photos and the level of research provided in this book make this book an essential document for the modeler and historian. Thanks to Aeroplane Books for the review copy. You can get your copy of this book, as well as, the first volume from their website at https://www.aeroplanebooks.com/ . Please let them know you heard about it here.